Winter Beet Butternut Squash Salad Recipe | Simple Fall Favorite Salad! Winter Beet Butternut Squash Salad, a simple fall salad with red beets, butternut squash, cranberries, red onions, and pumpkin seeds. Fall in a bowl! Are you a beet lover or a beet hater? 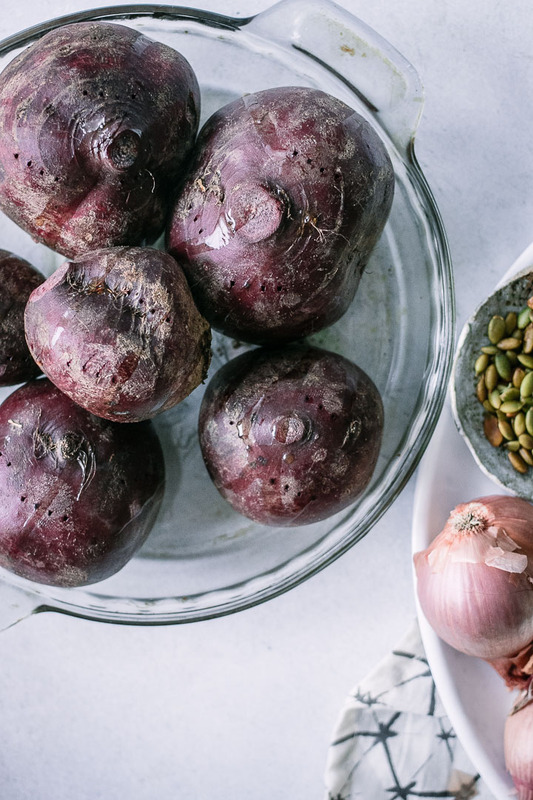 I was firmly a beet hater for most of my life, but a few years ago my tastes began to change and the earthy flavor of beets began to grow on me. 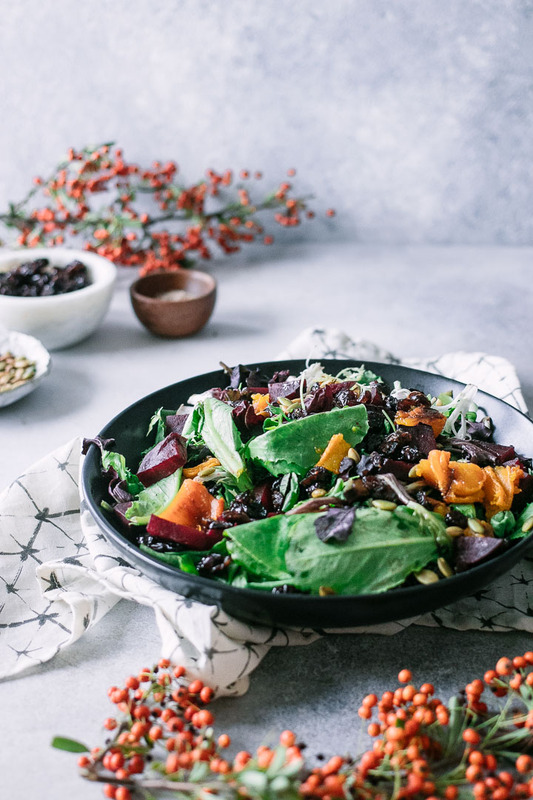 Now I love beets any which way I can get there: beet soup, beet fries, beet carpaccio, and even just a big bowl of greens and beets — like this Winter Beet Butternut Squash Salad. 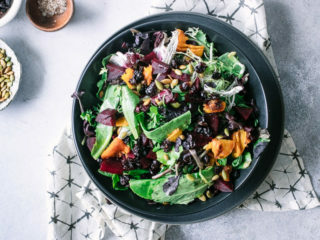 This Winter Beet Butternut Squash Salad is the perfect combination of leafy greens, earthy beets, and sweet butternut squash and cranberries. 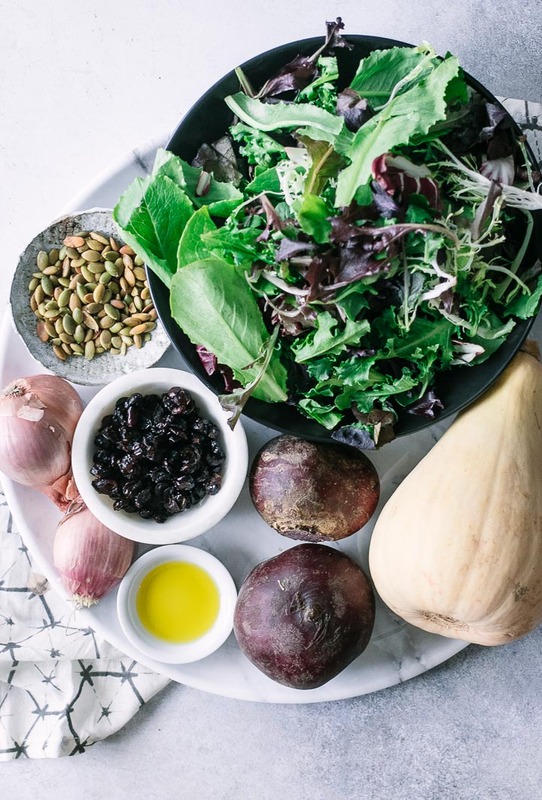 Topped off with pumpkin seeds and a warm apple cider vinaigrette, it’s a perfect healthy alternative for your festive fall holiday table. And it’s vegan, gluten-free, and ready in under 1 hour. Ready to find out how to make your new favorite fall salad? Let’s do it! Making this Winter Beet Butternut Squash Salad is super simple and, after roasting the beets and squash, it comes together in under ten minutes. And the first step is to roast the red beets and butternut squash. Wash red beets, but leave skin on and place them in a glass baking dish. Drizzle oil on top of beets and then cover with aluminum foil and bake until it can easily be speared with a knife or fork, about 45 minutes. Let cool, remove skin, and cut into small cubes. Peel, half, and deseed the squash, then cut into small cubes. Toss lightly with olive oil and then roast at 350 degrees F about 40 minutes, turning every 10-15 minutes to brown all sides. 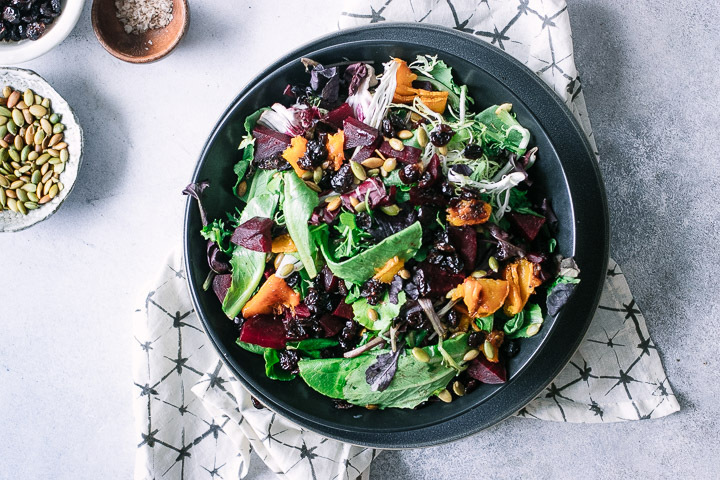 When the beets and squash are cooled and cut, toss them together with the mixed greens, red onion, cranberries, and pumpkin seeds. Top with the Warm Apple Shallot Vinaigrette, which is a blend of olive oil, apple cider vinegar, one shallot, brown sugar, and salt and pepper. I hope you enjoy this simple butternut squash and beet salad recipe! For more easy autumn-inspired salads check out our Butternut Squash Cranberry Kale Salad and Kale Persimmon Salad with Pecan Yogurt Dressing recipes, both great salads that are perfect for your fall table. Did you make this Winter Beet Butternut Squash Salad recipe? Leave a comment below and rate the recipe to let us know how it turned out. Save this recipe for later by pinning to your favorite fall Pinterest board and make sure to tag me on Fork in the Road’s Instagram to show me your squash creations! To roast beets: Pierce beets with a fork (with skin on) and place in a glass baking dish covered with aluminum foil. Bake until soft and cooked throughout, about 40 minutes. Set aside to cool, then remove skin with a small paring knife and cut into ½” cubes. To roast butternut squash: Toss squash cubes with olive oil and place on lightly oiled baking sheet. Roast in oven until soft and golden brown, about 35 minutes, stirring periodically to brown all sides. Set aside to cool. To make dressing: combine all ingredients in a blender or food processor, slowly adding in oil until dressing is well combined. Prep ahead: roast beets and butternut squash and mix together salad components up to two days ahead of time. Add salad dressing before serving. Leftovers and storage: if you plan to have leftovers, consider keeping dressing on the side and only added when time to eat or else mixed greens will wilt in storage. Store salad and dressing in airtight food storage containers for up to two days (dressing for longer). Nutrition: nutrition information calculated with only half of dressing in recipe (you will have leftovers). 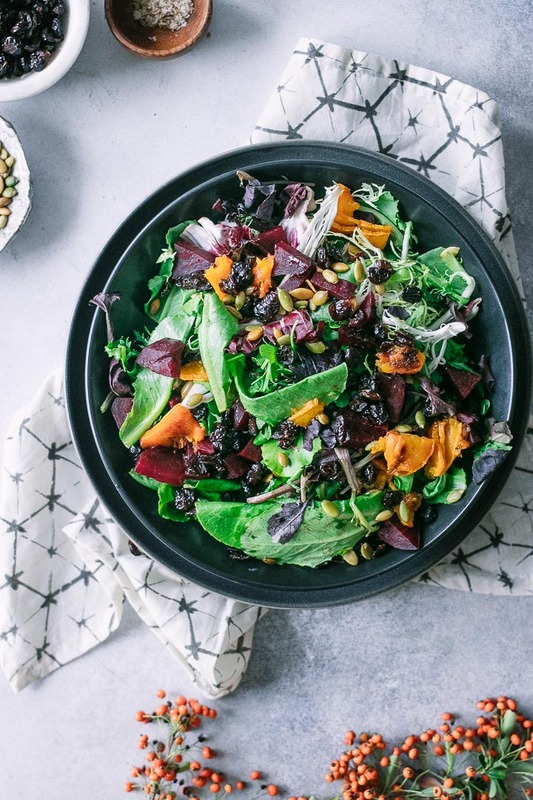 This roasted vegetable salad is completely vegan and is a good source of plant-based protein. It is also high in fiber and vitamin A. What a delicious salad! I love beets and butternut squash and this was a really light and perfect winter alternative. Thanks! I’m glad you liked it, I love beets too and always try to work them into winter recipes however I can.